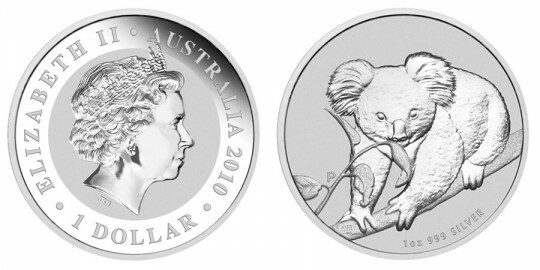 UPDATE: The Perth Mint has issued the newer 2011 Koala Silver Bullion Coin. For the fourth year in a row, the Perth Mint of Australia has issued what has come to be a very popular silver bullion series. The 2010 Australian Koala Silver Bullion Coins are available in four different sizes, 1 kilo, 10 oz, 1 oz, and 1/2 oz. All four sizes are set to be produced for demand, with no preset mintage level. Final quantities for the year will be determined when the 2010 Koala coins are introduced, thus ending production of the 2010 series. These coins are considered legal tender Australian Currency Act 1965, but their intrinsic value will exceed that of their face value. That being said, the four coins denominations are $30, $10, $1, and 50 cents. Struck from 99.9% pure silver, the obverse shows an image of Queen Elizabeth II while the reverse has the koala design chosen for 2010. Added to this years issue is a delicately frosted table enhancing the shiny koala design. An image of Queen Elizabeth II is shown on the obverse along with the inscriptions "Queen Elizabeth II", "Australia", "2010" and the denomination. The reverse features a young koala on a tree branch eating gum leaves. Also present are the inscriptions of the weight, "999 Silver" and the Perth Mint's historic 'P' mintmark.